My personal style oscillates between classic prep and feminine romantic (although lately it has been decidedly more romantic). This is not always the easiest aesthetic to shop for in Europe. While European high fashion can be incredibly chic and feminine, most European street style, especially Italy's, just doesn't do it for me. There is a lot of cheaply-made and ill-fitting androgynous looks. My biggest frustration abroad is the lack of more affordable, mid-range items. Sure I love Dolce & Gabbana, but I can't afford to wear it! 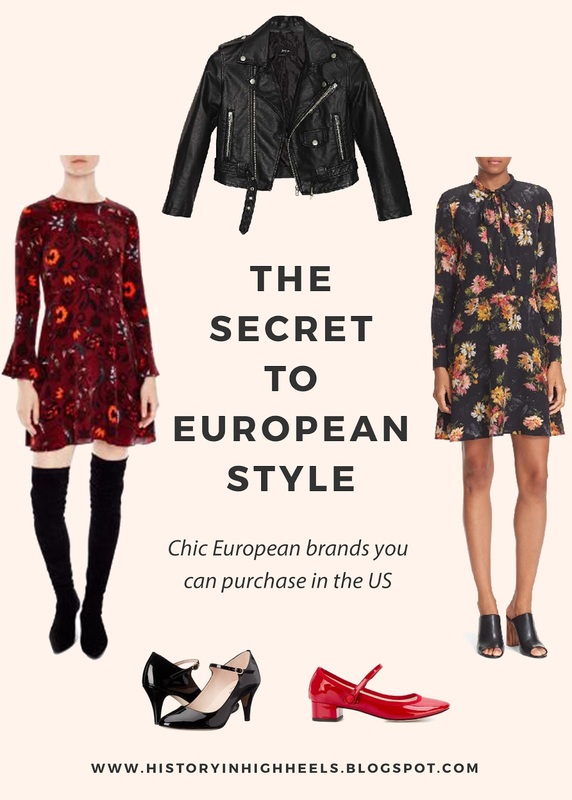 So, over the years I have discovered several brands that actually fit me well and complement my personal taste (while I do advocate embracing European style while abroad, I don't disregard my own personal style). I would not go so far as to call all of them mid-range when it comes to price, but in the European context, they are more affordable. I find that generally fashion is slower in Europe. Women tend to invest in fewer items and wear them more often. Repeating an outfit in the same week is not a fashion faux pas. I would argue this is the secret of French fashion and how some French women always look so chic. They purchase one expensive dress that looks amazing on them and then wear the hell out of it. I am still working on this lol. Thanks to the ever-expanding global economy, you can now find most of my favorite European brands for sale in the US! So, I thought I would round up a few of my favorites. Click the pics to shop! Repetto began as a ballet shoe company and continues to make the most gorgeous and timeless yet modern ballet flats. I feel like every woman in Paris wears ballet flats constantly (or Stan Smiths on casual days). I have a couple pairs and I live in them. They hold up well on the rough streets of Europe and the patent leather versions barely show any wear. Zappos stocks a great selection year-round and 6pm has great sales! Sandro is the epitome of the cool, effortless French girl look. Their signature style is the feminine dress paired with a tough leather jacket. And you no longer have to travel to Paris so shop Sandro. Bloomingdales now carries a good selection. The Kooples is another hip French brand making its way to the States. It is an interesting mix of Parisian prep and unisex rocker. And fun tidbit, all of their adds feature real couples. Bloomingdales and Nordstrom are leading the way in offering this brand stateside. Sister Jane is a British brand based in London that has mastered feminine whimsical but eclectic style. You can shop Sister Jane via ASOS. Jack Wills is the British version of Abercrombie, lots of trendy sweats and tees. But, like Abercrombie, some of their items will surprise you. They really shine when it comes to sundresses in the summer and plaid skirts in the fall. They are also the most affordable option listed and available directly through their US website or ASOS. Related Apparel offers a lot of well cut and tailored pieces with just the right amount of playfulness to make the clothes feel fresh and modern. It's another London-based brand and they ship to the US directly from their website.